What’s the best way to find out what users think about your service? Ask them. Twitter appears to be adopting that approach in the UK, where it has opened an online research group to help understand more about how people use its microblogging service. 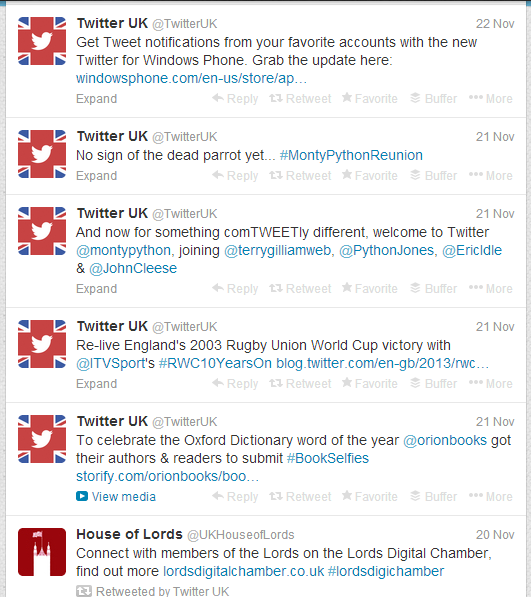 Named #Birdsignals, the site was first made public by a tweet from Twitter UK last week. Curiously, the tweet below doesn’t appear on the @TwitterUK timeline, which confused some users and suggests it may have been sent to a limited audience with the intention of keeping things quiet. We’ve just launched our UK research community. If you’d like to join us, click here : http://t.co/QRH2Pi8DHW. Users can sign up to take part but only selected people are accepted since Twitter is trying to assemble a spectrum of different kinds of users. The site requires you to link the service to your Twitter account and then submit a series of details — date of birth, gender and location — after which it is decided if you are part of a demographic that isn’t already covered by the existing #Birdsignals user base (in which case you’re in), or whether there are already enough people like you in the system. But those that do get in will see a little more information about the project. Essentially, Twitter is building a collection of users that is representative of its UK user base in order to push out polls and surveys for feedback. It also appears that there will be a user forum, though it isn’t clear how that will work. No surveys have been sent out as yet, and the only poll listed on the site is a short one that asks about using Klout, so there’s not much you can do from the main screen once logged in — as we found. It seems pretty clear what Twitter’s intention is here. The company has been in experimental mode for the past few months, but this is a different way of tapping into users. We’ve seen Twitter test various different incarnations of its mobile apps this week, it introduced and then removed the option to get DMs from anyone, has tinkered with TV-focused features and is also rumored to be considering a standalone Direct Message app. In most of these cases, it has tested features among a small subset of users to get data and feedback — introducing a user feedback group could be valuable because it enables Twitter to get opinions without having to push features out and potentially annoy some users. 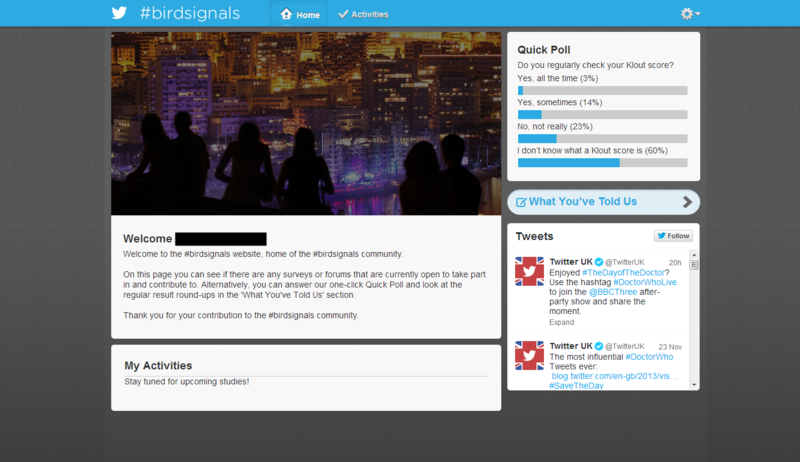 We’ve contacted Twitter for comment as we try to find more details about its plans for #Birdsignals. It will be interesting to see how it develops in the UK, and whether the concept spreads to the US and other markets too. If you want to take a shot at joining, visit Birdsignals.co.uk and follow the instructions. Update: The first survey was released this week, asking #Birdsignals members how often they use Twitter; what they tweet about; what you RT; what features of Twitter they use; who you follow; which apps they use to manage Twitter account; and who they engage with most often.